I’m angry this morning. 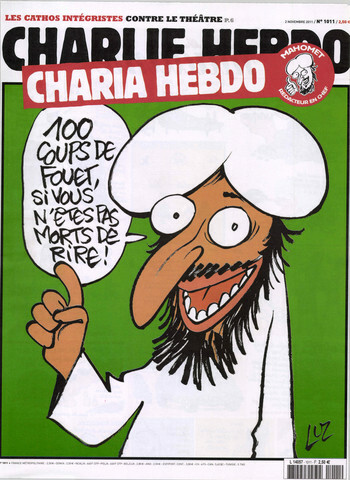 Terrorists have attacked a French satirical magazine for making fun of Islam. And to make matters worse, the US media is blurring out the images of the offending cover, because despite all their self-flattery about their “courage” and “speaking truth” to the utterly not-threatening-to-journalists “power” that is the US government, they won’t take a real stand against real threats. Mocking religion is rude. I don’t do it, myself, and I’m not particularly fond of people who do. But mockery is a FUNDAMENTAL and CORNERSTONE right in a free society. Furthermore, it is a basic tactical reality that the correct response to ambush is immediate, furious, unhesitating counterassault. Turn toward the threat and charge. The very moment that somebody is physically assaulted for mocking speech, it is the duty of anyone who cares about freedom of speech to take that mockery and put it front and center. They can kill some of us, but they can’t kill all of us. Unless we’re too busy cowering, of course. This sad event also highlights why concealed carry, and weapons ownership generally, isn’t the province of the paranoid or the delusional, but as fundamental a right as free speech. I’m not going to say nobody can kill me. I’m just going to say, it won’t be a low-risk endeavor to try. And why should it be? Tyranny should be difficult and expensive and bloody for the tyrant, whether the tyrant is one one guy or millions. So here’s the offending image: spread it far and wide. And book a range trip to exercise your trigger finger, and schedule a bit of mat time to work on your hand-to-hand skills. When the enemy is terrorists, we are all on the front line.